The Long-whiskered Owlet is one of South America’s most elusive birds. 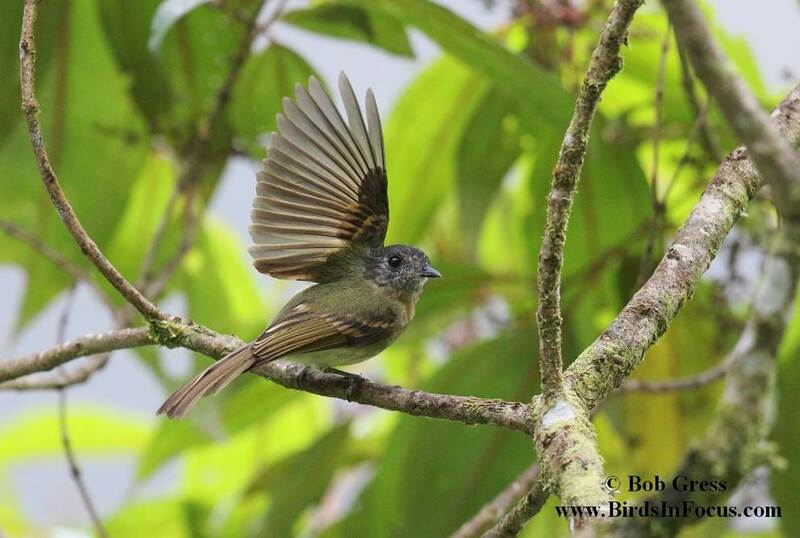 It is strange, tiny, nocturnal, shy and endangered; sounds like the perfect bird to search for! In 1976, ornithologists from Louisiana State University were surveying birds in a remote cloud-forest area in the Andes Mountains in Northern Peru. They were stunned when they captured a bird, in a mist net, that was unknown to science. The bird was a tiny owl about five-inches tall. It had a wild look with bright, orange eyes, stubby wings, short tail, and long facial whiskers. The bird was so unusual it was given the scientific name of Xenoglaux, which means “strange owl”. Twenty-five years would pass before it again showed up in a mist net, in the Abra Patricia (Patricia Pass) area, where it was initially discovered. It was classified as “endangered” and the population was estimated to be 250-1000 individuals. 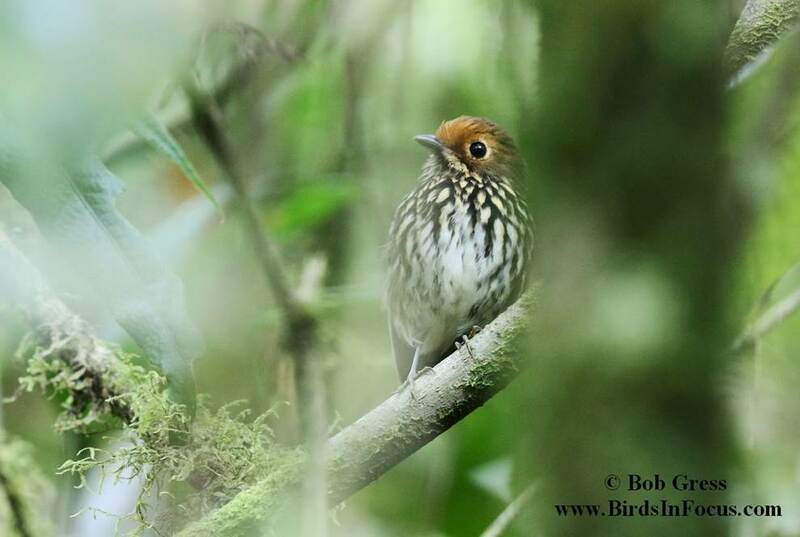 But this was only a guess, as an accurate count was impossible due to the bird’s elusive nature and its habitat of mountainous cloud forest, with dense undergrowth, lush with epiphytes. Not until 2007 was the bird finally observed in the wild. This time it was also recorded. With this recording, more thorough searches were then possible. Another bird was seen in 2008. In 2010 another was seen and five were heard. It has now been located in a total of three sites. 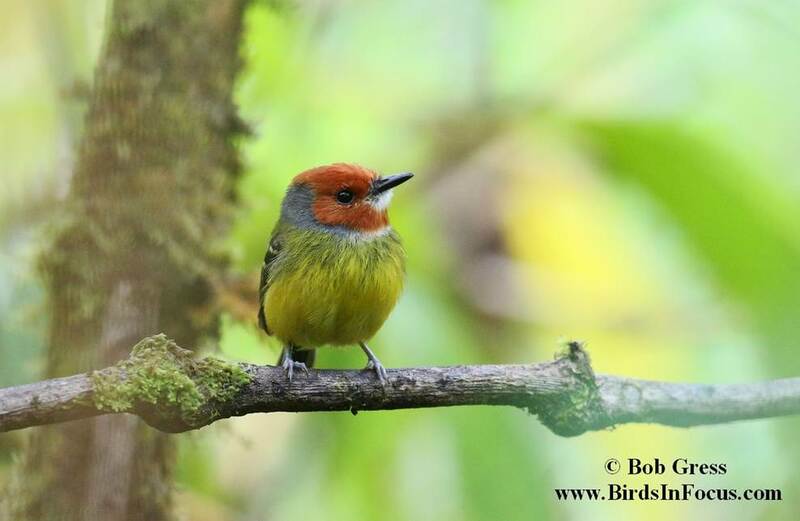 From July 11-24, 2015 a group of ten of us traveled on a Mondo Verde Expeditions birding journey to Northern Peru. Trip participants were Bob Gress, Kevin and Laura Groeneweg, Jim and Patty Marlett, Art and Karen Nonhof, Will Chatfield-Taylor, Mario and Jeanine Corvetto, and our birding guide Silverio. On July 14-16 we stayed at Owlet Lodge at Abra Patricia where there is “a chance” to see the owlet. In recent years, the birds have been seen in this area but have become increasingly difficult to locate, probably due to birding pressure and their reluctance to respond to playback. On the evening of July 15th, Silverio, Patty, Kevin, Karen, Jeanine, Will and I traveled down the highway to the Alto Nieva private nature reserve. We hiked along a beautiful canyon stream into dense cloud forest. In a small grove of wild bamboo, beneath the cloud forest canopy, we turned off our lights and waited quietly in the dark while bats darted above us. Once fully dark, the guide from the reserve quietly played the call of the Long-whiskered Owlet. Within ten minutes an owlet flew in and called softly in response. The bird was tiny and about 30 feet away! Restricted to only the guide’s flashlight, viewing was done quietly and quickly. Several of us attempted photos with the flashlight beam. As expected, they were dark and blurry. Those of us with camera flashes were allowed only a few flash attempts. I took five. There wasn’t much room for error or to fine-tune the process. This image was my best. With big smiles beneath our headlamps we hiked quietly back through the dark. The feeling was exhilarating! 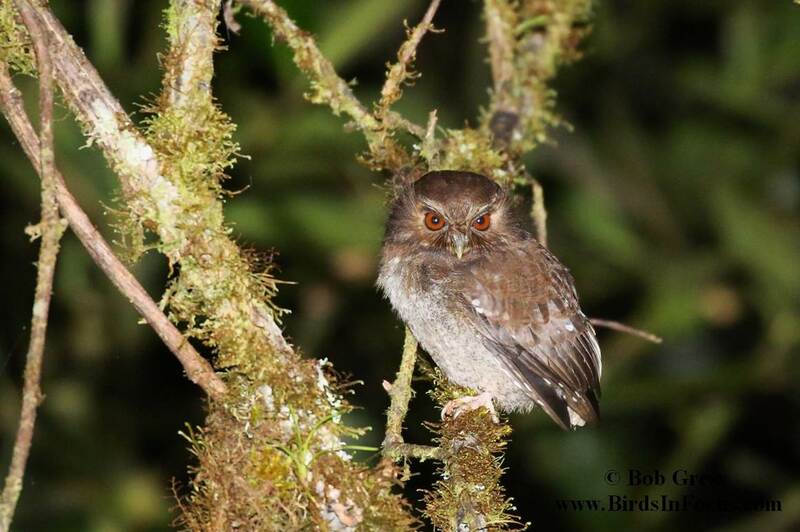 We had just seen and photographed the near-mythical Long-whiskered Owlet!!! 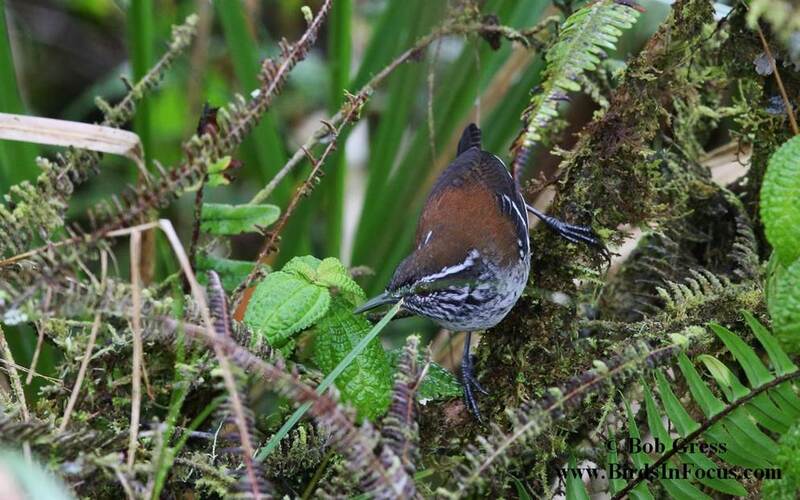 Does chasing endemic birds in the Andes interest you? Here’s your chance. This time we are going to explore Colombia! Time is quickly running out to join us. I need to know ASAP if you are interested. Let me know ASAP and I’ll send the complete itinerary, costs and tempting bird list. Email me ASAP at bobgress@cox.net. Look over the information and then let me know ASAP if you want to join us. Don’t’ wait if you want to go! With over 1,850 bird species, Colombia is credited with having the largest bird list of any country in the world! 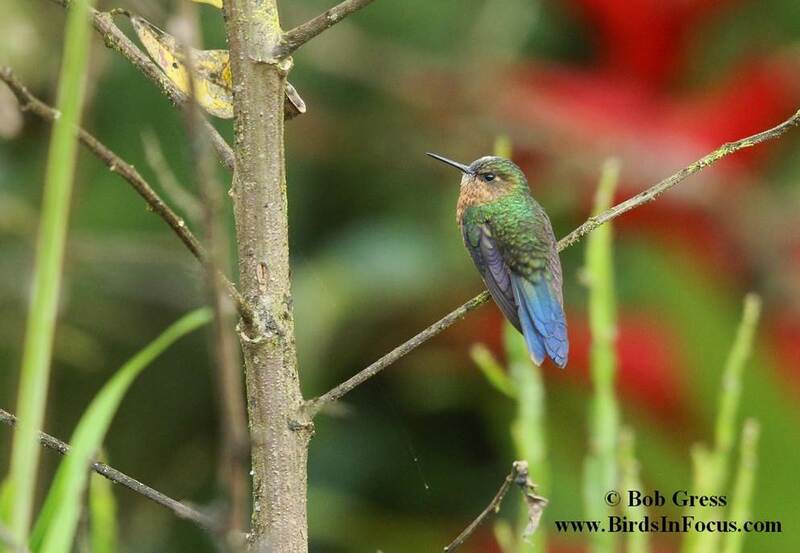 Colombia also has over 70 endemic birds (found only within the country). This birdwatching trip concentrates on endemics in the Colombian Andes but we’ll find plenty of other species along the way. Recent trips on this route have yielded over 500 species! What an amazing destination! Our guide will be an experienced Colombia birding tour guide and in some locations we’ll also work with a local site expert. This is a trip for birdwatchers. Participants should be in good shape and able to hike comfortably over trails and across a variety of habitats. Early mornings departures are normal. This trip is limited to only 8 participants so let me know ASAP if you would like to receive an itinerary. We must fill this trip by early September in order to finalize lodging arrangements. The itinerary will include all the details of locations, birds that may be seen, lodges and hotels, cost details, registration information, and payment deadlines. Let me know if you have any questions. For the itinerary, email me at bobgress@cox.net.